Nano Augmentation: A Reality ! One great scientific innovation lies in two of the most happening branches of Science, Nanotechnology and Augmentation Technology. Augmentation means connecting the physical world with the digital one in real time. However, the ongoing problem with the augmentation world is that no real time interface exists that can effectively bridge the gap between the physical world and the digital world. The current interface are mostly bulky (head mounts) or destructible (Ipad). They also don’t allow complete freedom of manipulation of the physical data and has considerable time lag in the digital world. To address this, Nano Technology comes into picture. Nano Technology allows us to create new sub atomic materials by manipulating matter the size of 1-100 nm. What is proposed here is implantation of Nano Augmentation, digital hardware the size of nanometers, manufactured with the help of Nano Technology. With Quantum mechanics at play, Nano Particles serve as perfect interface between the physical and the digital worlds. These Nano Implants can be then hardwired directly into human brain or nerve cells, hence forth making the time lag negligible. With advancement in laser surgery, it’s plausible to think of nano surgeries. Furthermore, with instructions hard coded into the nano implants, these nano augmentations can ease up significant number of human needs. A brain augmented person, for example, can have perfect memory retentive capacity, the ability to share information on the fly and the ability to process the physical world in cybernetic conception. Information exchange would increase significantly, as all people would be connected in the digital world. Concluding, we can say that even with the sheer risks involved, the endless possibilities poised by Nano Augmentation as an interface cant be ignored. It would completely change the standard of living, with the profound information exchange making the global village even smaller. Mr. Clarke was perhaps very right in these words. We live in a world where magic exists, thanks to the ongoing technological revolution. One such technological innovation lies in perhaps two of the most happening branches of Science, The Nanotechnology and the Augmentation Technology. Augmentation here has broad meaning, but processing the word in the scientific sense, it means modulating the Physical world with which we interact and moulding it with cyber interface. Speaking more specifically, augmenting means connecting the physical world and the digital world real time. Augmentation is generally achieved by Interfaces, such as head mounted displays, to connect the digital world and the physical world. Nanotechnology is defined as the study of manipulating matter on an atomic and molecular scale (on the size of 1 to 100 nm). Broader sense again, we can actually manufacture hardwares the size of nanometers by manipulation of atoms and electrons. With Quantum mechanics at play, the implications of Nano Tech is huge. We can create new atomic level materials that can have effect on every conceivable genre of Science and Technology, especially medicines. But perhaps the most exciting aspect about nano technology is that it can help us bridge the gap between biology and hardware, as nano hardware can easily act as implants due to it’s sheer small size. Although several attempts have been made to bridge the gap between the physical world and the digital world, it’s the interface which has always poised a problem. The existing interface has numerous problems that warrant a potential shift to nano implants. Destructible: Many such interfaces are destructive in nature, or can be easily misplaced or harmed. Their tendency to attract easy physical damage creates a problematic scenario. Time Delay: The existing interfaces, though offers near about complete augmentation experience, are severely limited by the delay in establishing connection between the physical and the cyber world. This delay hampers the ability of interfaces to attenuate the physical world event at exactly the same time in the cyber world, and vice versa. Incomplete: The interface never offers the complete augmentation experience, i.e the ability to perceive the cyber reality and the physical world, modifying it on the fly. They are limited to the simple commands. Complicated: The interface takes lots of time to set up the augmentation process. Additionally, they create lots of unnecessary hassles in establishing control. Dangerous: Current implants are mainly composed of electrodes, chiefly, 500 microns thick (5 times human hair). Additionally, they consist of several sharp electrodes (Brain Gate has 96 electrodes), which pose the danger of brain damages. Also, even if there are no implants, the traditional interface always pose a danger, be it hardware failure or bodily harm through improper electric insulation. Redefining the Nano Augmentation word, they are the nano implants that replace the existing problematic interface, and serve as the new upgraded interface with many added functionalities. Using the concept of Nano Biology, they can also act as cell replacements in the near future. 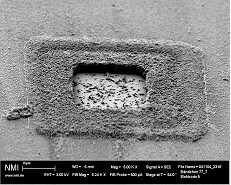 A Nano implant is generally manufactured from inorganic materials such as silicon or germanium with the help of nano technology. They consist of Power supply, Communicator module, Chemical synthesizers, Nucleus probe with sensors and mechanical effectors and a virus detector/eliminator. The functionality of the implants are hard coded into them. These nano implants are then surgically placed into the required body parts. The bottom line here lies in establishing a clear communication link between human nerves and the implant’s communicator module. These communications are enhanced usingpartially invasive Brain Computer Interface (BCI) methods or Biosensors. Partially invasive BCI means that the implants are not inserted into the brain or the said body part, instead, the implants are just glazed into the surface of the brain or the said body part. Hence forth, it is necessary that the implant must depict an almost artificial neuron behavior, as for real time communication process it is mandatory to instigate an artificial immune & communication system. That’s because it’s our body’s immune system that acts as an interface between the human thought process and the neurons. We seek to inject this natural interface with our artificial one, so as to grasp the human thought process and transform it into digital commands via Nano Implants. Hence forth, the nano implants, at it’s basic, must depict artificial neuron behavior as far as possible. The communication process of body and hardware would happen between the tendrils of human neurons and the implants, much like the neurons interact with other cells. Nerve signals generated by action potentials and electrical energies generated by brain cortex, or specific area of brains would be detected by Bio sensors, and then transferred to the Communication module inside the nano implants for feedback. The implants would generate a similar target signal to interact with the human body. Broadly speaking again, a similiar kind of interface would be formed between human thought and artificial implants, much as the interface that is formed between human thought and neurons. Once the implants are in place, they are activated to connect digitally with the cyber world. Here, the communication process with the global net happens with the help ofWi-Fi, or more specifically, Radio Waves. Hence, a proper interface is established between the cyber world, the physical world and the human body. 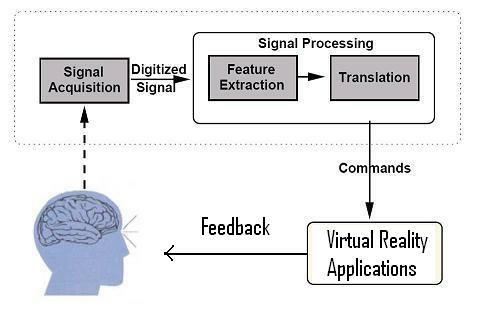 Given above is communication process that happens between Nano Implant and the VR application. The connected implant picks up the EM signatures or signals generated from the brain cortex or target dendrite. These electrical signals are then digitized, processed in real time, translated to the application signal and then finally, the signal commands are transferred to the said VR application via Wi-Fi in the form of Radio waves. 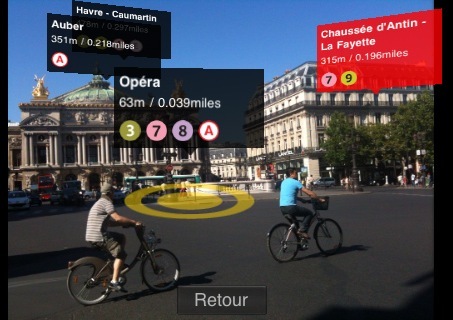 The reverse happens in case we want a feedback from the VR application. The received Wi-Fi or radio wave signal is converted into the electrical form, and then fired back into the neurotic network or the targetted dendrite via Implant’s Communication Module. Henceforth, a two way connecton is established almost seamlessly. is the magnitude of stimulus current. Henceforth, creating the digital circuitry wont be much of a hassle. Now we discuss the equations once the artificial implants are in place with the natural neuron circuit. 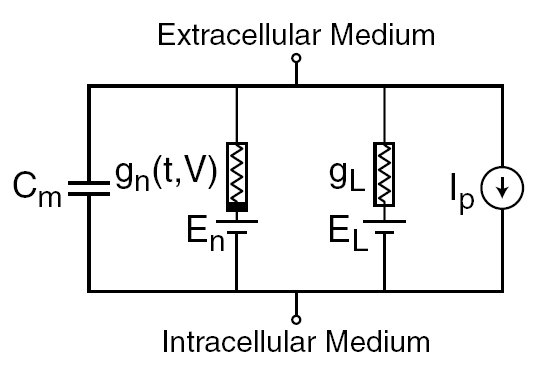 For a given artificial neuron, let there be m + 1 inputs with signals x0through xm and weights w0 through wm. Usually, the x0 input is assigned the value +1, which makes it a bias input with wk0 = bk. This leaves only m actual inputs to the neuron: from x1 to xm. The output of kth neuron is: Where (phi) is the transfer function. Hence we can see, the output behavior is analogous to a natural axon circuit of a human neuron. Its value propagates to input of the next layer, through a synapse. It may also exit the system, possibly as part of an output vector. Broadly speaking, the output of the kth neuron, in this case our artificial implant, would be analogous to the output of the kth natural neuron in the complicated dendrite circuit. Henceforth, we would take inputs from several targetted dendrites, and calculate the output of the artificial implant using the given equation, faciliating our knowledge of the output voltage generated in the Hodgin-Huxley model or the reimagined Nano Implant digital circuit. The above pic approximately denotes the nano electrode which we would use for the partially invasive BCI process. As explained before, we wont be fitting the implants directly into human brain, as that would prove to be very dangerous to the brain in case hardware failure happens. Henceforth, we would need electrodes to extract the signals generated from the human neurons. To faciliate this process, we would need nano electrodes. The entire implant except the electrodes would be properly insulated to prevent any kind of electrical leakage. The electrodes itself would be made of gold as molecular pharmacologist Roberta Brinton has discovered that neurons adhere better to gold than to other substances. Even after we create the nano implant, we would need the functionality hard coded into them. For that purpose, we would need an algorithm to program the digital implants in depiciting the artificial neuron behavior. The following is a simple pseudocode implementation of a single step function of a neuron. It takes boolean inputs (true or false), and returns a single boolean output when activated. An object-oriented model is used. If a purely functional model were used, the class TLU below would be replaced with a function TLU with input parameters threshold, weights, and inputs that returned a boolean value. In quite a similiar fashion that we would apply to Hodgkin-Huxley model, we could modify this algorithm to serve our purpose in coding the functionality of the artificial nano implant. The coding itself would be done is processor language. 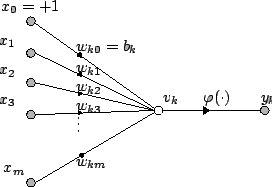 But at the core would lie this algorithm which accurately depicts the step function of a neuron. The need to shift to new Nano Interface can be argued by the sheer number of advantages it offers. It completely rectifies the many defects of the existing bulky interfaces. Owing to their very tiny size, the bulkiness factor is immediately rectified. Secondary, with instructions hard coded into the implants, no scope of any kind of tampering arises with the implants. Since these are natural implants, they would be a medical ease to fit by, kind of similar to the establishment of prosthetic limb (which is a medical ease nowadays). Also, since these implants would be in direct synchronous with human body, no factor of any time delay can arise. They would also be superior to the traditional implants in every aspect, posing no danger to the brain or organs whatsoever due to the very tiny size of the electrodes. However, certain problems do arise. Chief among them is the Surgical process itself. Will it survive? The answer to this rhetorical question lies in the fact that recent advancements in Laser Surgery and their applications have simplified the process. So implantation wouldn’t be much of a hassle. Much complicated implantations have been done with Prosthesis in this regard. Critics here might circumvent to Hardware failures. But hardware failure is a thing acknowledged by all engineers as unavoidable (Murphy’s Law). We can though, reduce the damages posed. The implants can be made as such to melt under certain set of chemicals, posing no damage. These chemicals can be artifically taken in the form of medicinal pills. Furthermore, the implants would disconnect with human body in a similar fashion as a cell dies and a switch is offed. Another thing might circumvent towards the sheer information overload due to the 24X7 connection. However, just like we choose what to see or download from the internet, we could control the information exchange in quite the same fashion. Plausible Radio Wave damages might again pose a problem. However, no solid proof has been yet known to the engineers that radio waves damages human cells. Furthermore, multiplexing technique (dividing the simultaneous frequency transmission into different spectrum range) can altogether remove the little bit of risks involved. 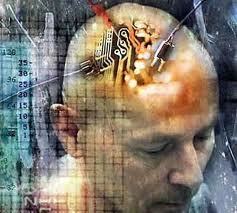 A brain augmented person would have revolutionary advantages over the existing humans. Perfect memory retentive capacity, the ability to store memory in another body if the current one retires and the ability to process the physical world in cybernetic conception are among some of the innovative features that could be implemented by the use of implants. Typical example of a memory augmented person would be a being who wakes up in the morning, has all his appointments and schedules flashed right before his eyes (via visual implants if need be), would download all the news or information directly into his augmented memory and everything he needs to know or remember would be flashed before his eyes in a matter of seconds. Ofcourse, his organic brain would be unharmed, as the organic brain is the receiver of all the augmented output the person perceives. Visual Augmentation yields even more possibilities, the ability to know the likes and dislikes about a person (similar to a facebook profile, only digital) in real time, the ability to download the information of, say a tourist building, in a flash, ability to see clearly in the dark with inbuilt night sensors and many others. 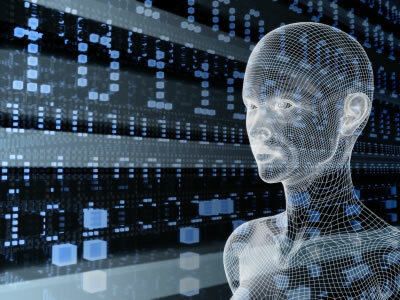 Physical augmentation would allow a person to directly link himself with the cybernetic interface (ranging from anything like an advanced public directory or a super computer) and seek and process the information in real time. The world would change as we know it, with the boundaries between the cyber world and physical world being blurred. Concluding on, we can say that even with the sheer risks involved, the endless possibilities poised by Nano Augmentation couldn’t be ignored. It addresses the current bulky problems posed by traditional interface, and adds much needed functionalities. Implants would communicate directly with human nerves with the help of bio sensors and direct targeting of human cortex, making it one of the fastest implants. Some problems might arise, especially in the means of Information Overflow and Hardware Control. However none of them are problems that cant be addressed. Nano Augmentation would completely change the standard of living, with the sheer information exchange making the global village even smaller. It would connect us in unison and perhaps erase the political boundaries altogether. With Nano Technology and Digital Augmentation being the newest technological rage, it’s only imperative that the combined usage of Nano Augmentation would perhaps be the most fruitful discovery of our times. This is what Electric Subliminal NANO also spy IMPLANT voice Harassment is and this is what is happening now all over the USA and in Wisconsin! A person around Central Wisconsin is doing this to people now and is vulgar, threatening saying they will stalk you singly and sexually (verbally!) everyday, also will taunt you hourly with intensive threats and will keep you locked up in your own home for good money when paid to do the criminal activity!They will target your total life through false criminal fax finding that is changed to screw you over hoping to change or get rid of you…forcibly and quietly! They do this to keep the victim you or whom-ever at bay and embarrassed hopefully causing heart or health problems and undetected harm using unheard vocal implant messages from the real person who is the implanter and also known as the paid sabotage criminal! This is a real internal hearing system that beats all of aw enforce and the court system we know of today!! And we hopefully military can pick these internal Nano/hearing death persons phone messages up with a NASA/Military Satellite and put these people in prison for what they are doing and it could be to anyone even your children! And this could be electronically dangerous to everyone around you if it is being picked up crossing other signals and may even be dangerous for you your pets also! Please let law and the real court system be the law enforcers, not some unknown criminal using implant internal cell phone updated spy talk or mind technology! It’s the system that beats the system of law enforcement! 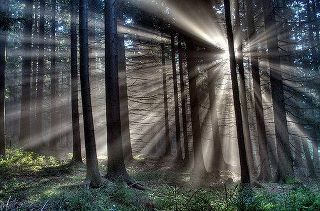 You can hear everything said clearly, but nobody on the outside can hear what is being said to you! You need to try the technolgy to really know how this is done and how it is heard by you to understand the technology! Then no one will be able to say you are a nut case! 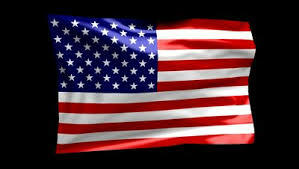 In other countries this technology is used everyday and is excepted for it’s use and is monitored for it’s use also!